Media captionPresident Trump: "We didn't have an interview"
The row has overshadowed key talks on the Republican party's 2018 agenda. Speaking to reporters after meeting with senior party members at Camp David on Saturday, the president disputed Mr Wolff's account, claiming it was a "work of fiction". Addressing the questions about his mental capacity, he said: "I went to the best colleges, I had a situation where I was a very excellent student, came out and made billions and billions of dollars, became one of the top business people, went to television and for 10 years was a tremendous success, as you probably have heard." He disputed Mr Wolff's claim of a three-hour on the record interview between the two. "It didn't exist, it's in his imagination," Mr Trump said, while acknowledging that he had been interviewed by the author at some point. The book, Fire and Fury: Inside the Trump White House, paints a picture of the president as impatient, unable to grasp policy, and prone to rambling and repeating himself. The fallout from the book has loomed over the Camp David meeting - a gathering of key Republicans designed to thrash out legislative priorities for 2018.
Who are winners and losers in Trump-Bannon row? 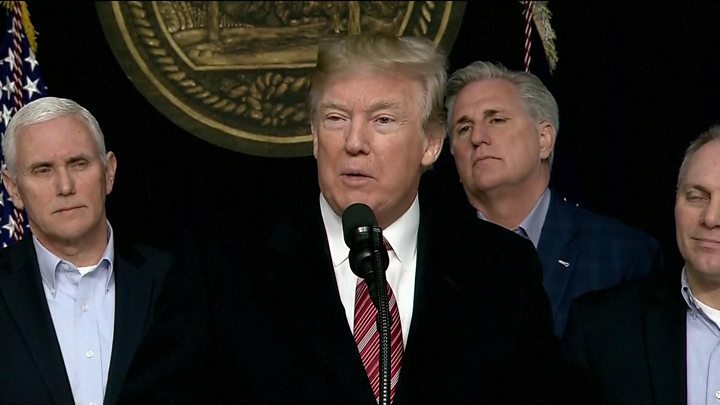 Mr Trump gave a press conference at the presidential retreat, flanked by Senate Majority Leader Mitch McConnell, Speaker of the House Paul Ryan, Vice-President Mike Pence and other senior Republicans. The president, who has previously derided Camp David and opted instead to stay at his Florida club, Mar-a-Lago, told reporters that the retreat was a "very special place" with a "feeling you don't have in many places". While short on detail, the president said the gathered Republicans had "a couple of incredible meetings" and discussed "security, infrastructure, the military, all types of military situations". On North Korea, he said he hoped rare talks between North and South Korea will go "beyond the Olympics," with the US joining the process at the "appropriate time." He said the country would fight the scourge of drug addiction, and praised the success of countries that have treated the problem "harshly" - "those are the ones that have much less difficulty," he added. He has previously praised the leader of the Philippines, Rodrigo Duterte, over his drug policy. Mr Duterte has encouraged the extrajudicial executions of drug offenders by police and vigilantes. On immigration, he said he hoped to work with the Democrats on a resolution to Daca, the so-called Dreamers programme for immigrants who came to the US as undocumented children, and reiterated that Mexico would in some way pay for his border wall. 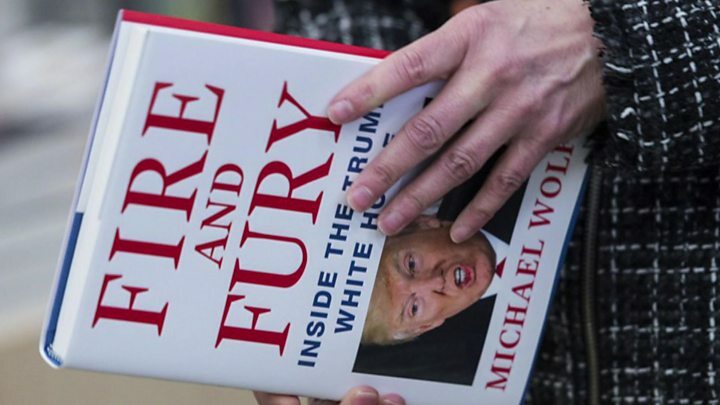 Fire and Fury went on sale early on Friday, days ahead of its scheduled release, amid the president lawyers' attempts to block its publication. 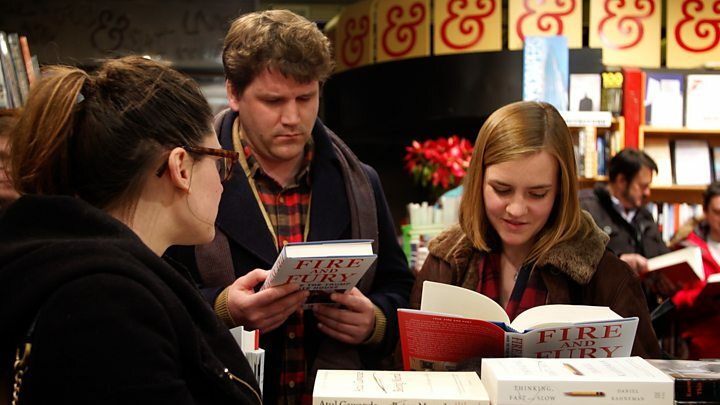 It has become an instant bestseller. The book describes a Trump team shocked by their own win on election night, White House staffers saying Mr Trump's "mental powers were slipping", and senior administration officials calling Mr Trump an "idiot". It has also sparked a public rift between Mr Trump and his former aide Steve Bannon, who is quoted as accusing Mr Trump's eldest son Donald Jr of "treasonous" behaviour in meeting a group of Russians. Mr Bannon and the author have both been the target of the president's ire over the past few days - the former cried when he lost his job last year, Mr Trump said; the latter had written a book "full of lies", he added. On Friday, US Secretary of State Rex Tillerson told CNN that he had "no reason to question" Mr Trump's mental fitness. Perceived slights, insults and questions about his intelligence. If Donald Trump's recent Twitter feed is any indication, these are the topics on the president's mind as he settles in for the night and when he rises in the morning. Given the daunting tasks facing the administration and Congress in the coming weeks, some of his allies and aides at Camp David may view the president's concerns as misdirected. That Mr Trump feels compelled to respond to criticism, however, should come as little surprise. This is particularly true when the topic is his intellect, the strength of which he frequently boasts. In Fire and Fury, Michael Wolff recounts tales by White House aides of a president with a short attention span, bouncing from issue to issue like a pinball. In recent interviews, the author has said the president's aggressive reaction to his book proves this point. It seems, however, that Mr Trump's counterattack is just getting started. Would Trump win again today?